Today was a glorious, mellow day in Stone Town. We even slept in, since there was absolutely NOTHING on our agenda today. We went up to the roof at 8:30 for breakfast, which was, of course, exquisite. First course: fresh fruit. I don't even know what some of these things are! But so good. We also had fresh pressed tamarind juice. After we finished off the fruit we had toast and eggs and spiced tea -- a perfect start to the day. Then we went downstairs and out for a wander through town. We headed toward the big market, but missed the produce section and found ourselves in the very raw meat section before hightailing it out of there. Then we crossed Creek Road -- a former creek filled in by the British -- which separates Stone Town from Ng'ambo, literally "the other side" in Swahili. While wandering through Darajani Bazaar we passed shops selling everything from UHD 64" TVs to electric kettles to fabric to tile and paint to toilets. We even saw some great graffiti. We accidentally stumbled across a biggish supermarket ... and you know how much I love a supermarket. Especially when it's got a sculptural light fixture like this outside. Kwality Supermarket, indeed! And others that seemed pretty magical. But the toiletries stole the show. I don't know why we didn't buy at least one of these body sprays. Possibly because we were paralyzed by choice. I mean, did we want the iPhone 4S, or twitter? Not a fan of the iPhone? Perhaps a Galaxy S spray? But all I bought was a soda and a box of tea. Ho hum. Later we wandered into the Park Hyatt Zanzibar ... because no one is going to question two middle-aged white people who walk in like they own the place. We explored the lobby area, then sat for a while on the terrace and admired the view. We even went looking for a restroom, found the locker rooms for the gym, and Wil snatched a wooden comb while I admired this garden terrace. I am absurdly jealous of the comb. We wandered along the seafront, and then had smoothies and chips at the adorable Baboo Cafe. We then slowly made our way back to Emerson Spice for a nap, having been walking around town for five hours. We had a nap in our cool, breezy room. So pretty! 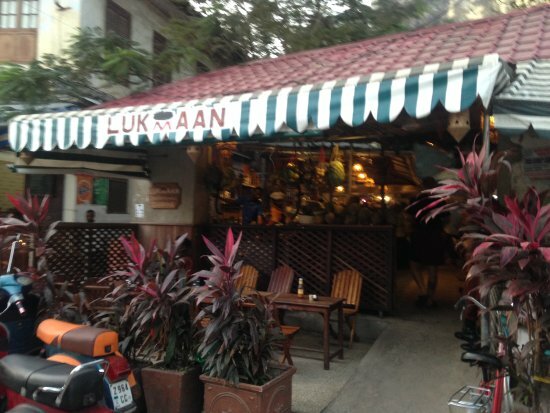 Then we made our way to Lukmaan's for dinner. Of course, we had to find it first! We ended up up in Jaws Corner where, true to its name, people were moving their jaws talking loudly over cups of coffee. 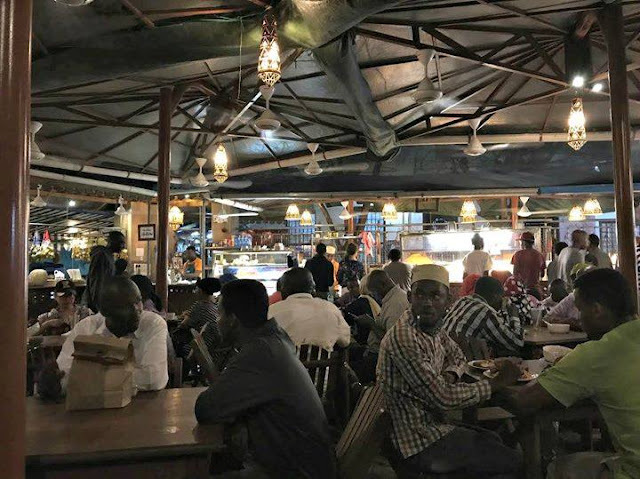 Lukmaan is famous for Zanzibari cuisine at great prices. 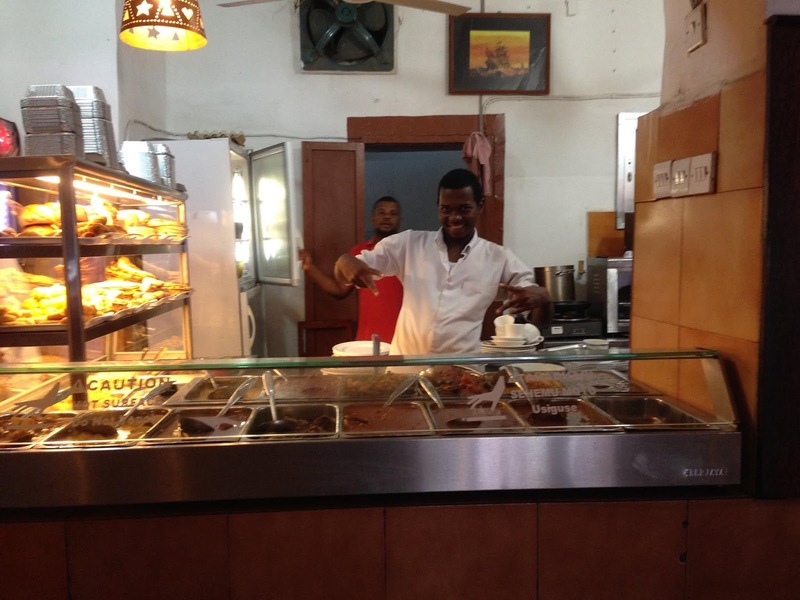 It's the only place we encountered where locals and tourists (well, backpackers at least) rub elbows. There isn't really a menu, you just go to counters and choose various dishes. Of course, there are also servers moving through the crowd to help first-timers like us get through it. One took us around the counters and showed us what all the different options were, then took us back to the start to pick out our food. With so many choices -- curries, rice dishes, grilled seafood, various breads -- we ordered TOO MUCH FOOD. How much food? But wait, there's more... I also ordered, at the grill station, "large octopus". Which, when it arrived, was SO OBVIOUSLY TENTACLES it made me pause ... and made Wil look away. This isn't my image -- I couldn't bring myself to photograph it -- but it's essentially what was served. You may recall that Team Wil-Sun is vegetarian 99.9% of the time. 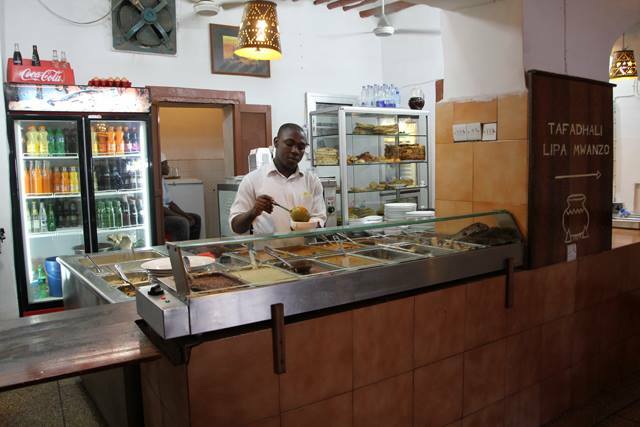 But I had heard how great Zanzibar seafood was, so we decided to try some. 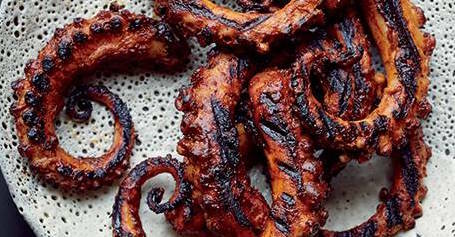 Our verdict on the octopus? Mixed. Wil couldn't eat it, but I really liked both the flavor and the texture. Sorry octopus! 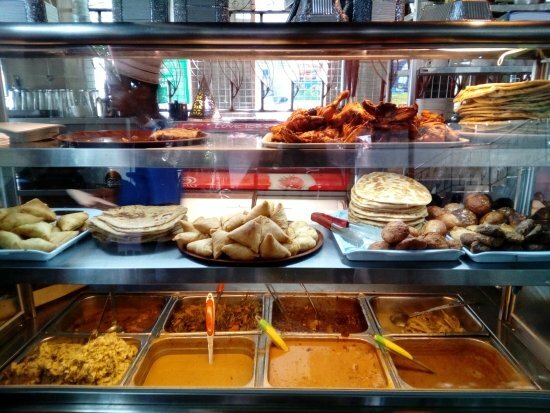 All the food and drink -- two Cokes, rice bread, garlic naan, a pea curry, fish curry, biryani and another rice dish ... plus the BIG OCTOPUS ... came to just 25,500 TSh: about $12. Of that 16,000 was for the octopus alone -- but so well worth it! The food was delicious, tasted authentic, and felt like an exciting dinner. I'd eat a smaller meal there again! Then we headed home, getting lost at first after a series of wrong turns, and then walking past the market to a street we had walked down in the daylight. We kept thinking, "Well, it's okay ... lots of people about." And then suddenly there was no one around. Then we thought, "Okay, at least it's well lit." And then it was pitch black. But, luckily, one short stretch in the dark and the street opened up to familiar territory by the big mosque, so we knew we had made it home. Still completely in love with Stone Town and its people.